Are We Wasting Our Money on Education? One Projector. Two Ways to Interact. BrightLink™ 455Wi - Now with the flexibility of Interactive Table Mode. Make almost any wall interactive by installing BrightLink with the included wall mount or table install* for interactive use in small-group learning centres and student workstations. One simple solution, two ways to engage. Expand your interactive possibilities! BrightLink 455Wi gives teachers the flexibility to decide how to set up their interactive classrooms. See how you can use BrightLink to create i-walls or i-tables. Visit epson.ca/itable * Interactive Table Mode cannot operate without a mount speciﬁcally designed for this purpose. The mount included with BrightLink 455Wi is NOT an Interactive Table mount. Actual mount not shown. A suitable mount is available through Copernicus Educational Products. Please visit epson.ca/itable for more information about Interactive Table Mode. Epson is a registered trademark and Epson Exceed Your Vision is a registered logomark of Seiko Epson Corporation. BrightLink is a trademark and Brighter Futures is a registered trademark of Epson America, Inc. Copyright 2011 Epson America, Inc. Product speciﬁcations are subject to change without notice. Teachers, Enter and Win 1 of 4 EPSON Prizes! Join TEACH Magazine’s new Digital Literacy program and receive an exclusive digital issue of the magazine. IT’S FREE! Sign up today and you’ll also be entered to WIN an Epson BrightLink Solo Interactive Module for your school or one of three secondary prizes consisting of an Epson WorkForce® all-in-one printer. Epson BrightLink Solo Interactive Module (IU-01) Get premium interactive whiteboard quality and functionality at a fraction of the price. The Epson BrightLink Solo is an interactive module that connects directly to your computer, via a USB cable, and works with new or existing projectors. NOTES H appy New Year to all of our loyal readers! overlooked side of international teaching. Terra Cycle, and GoGo News. published in an upcoming issue of TEACH! Publisher / Editor: Wili Liberman Assistant Editor: Lisa Tran Contributing Writers: Grant Sundal, Richard Worzel Advertising Manager: Martin Seto Art Direction: Vinicio Scarci Design / Production: Studio Productions Circulation: Susan Holden Editorial Advisory Board: John Fielding Professor of Education, Queenâ&#x20AC;&#x2122;s University (retired) John Myers Curriculum Instructor, Ontario Institute for Studies in Education/ University of Toronto Rose Dotten Directory of Library and Information Services, University of Toronto Schools (Retired) www.teachmag.com TEACH is published by 1454119 Ontario Ltd. Printed in Canada. All rights reserved. 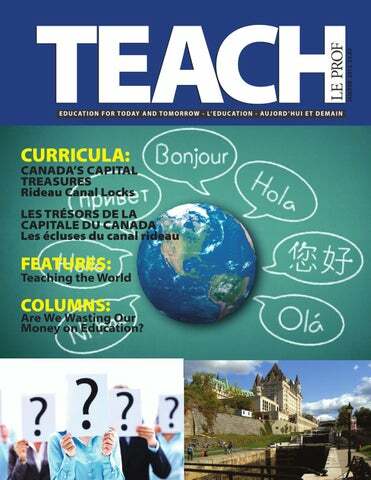 Subscriptions are available at a cost of $18.95 plus $1.14 GST including postage and handling by writing our office, 87 Barford Rd Toronto, ON, M9W 4H8 E-mail: info@teachmag.com T: (416) 537-2103, F: (416) 537-3491. Unsolicited articles, photographs and artwork submitted are welcome but TEACH cannot accept responsibility for their return. Contents of this publication may be reproduced for teachersâ&#x20AC;&#x2DC; use in individual classrooms without permission. Others may not reproduce contents in any way unless given express consent by TEACH. Although every precaution is taken to ensure accuracy, TEACH, or any of its affiliates, cannot assume responsibility for the content, errors or opinions expressed in the articles or advertisements and hereby disclaim any liability to any party for any damages whatsoever. Canadian publication mail sales product agreement No. 195855. ISSN No. 1198-7707.
the scope of a report on the future of education. can stir up some debate. dents. It is failing our society. Writin’, ‘n ‘Rithmetic, can we? Back to Basics, right? credentials that might enable them to find work. economy, and the society in which we live. emerge with a better understanding of humanity, the world, and their own place within it. ceeding even as we dive over the edge of that cliff. which I’ve written at length, here and elsewhere. free. Contact him at futurist@futuresearch.com. sonal growth, lucrative to boot. But in the end, you really have to care about the students you work with. It truly is possible to teach the world, but you have to do it one student at a time. And that begins with you. Grant Sundal taught in Ontario’s public system for 16 years before moving overseas to Colombia. After five life changing years as a teacher and administrator in South America, he is now moving on to the United Arab Emirates. References Bucher, Richard. Building Cultural Intelligence (CQ): Nine Megaskills. Toronto:Prentice Hall, 2007, print Gauci, Simon. “Beyond Borders: An Insider’s View on International Teaching.” TEACH Magazine. 01, September, 2010. Web. http://teachmag.com/archives/127 Livermore, David. The Cultural Intelligence Difference: Master the One Skill You Can’t Do Without in Today’s Global Economy. Print. New York: AMACOM, 2011.
uplifting articles that contrast the hard news. day very overwhelming and considers taking his own life. Level Up tells the story of Terry who is contemplating dropping out of school. But before he does, he’s asked to spend some time with his cousin Dave, a successful game developer. Rather than lecture Terry, Dave makes the importance of school relatable - he compares education to moving up a level in a video game. Teachers can order the books directly from the website and watch a short video showing focus groups test the stories and images with youth and health professionals. TerraCycle www.terracycle.com TerraCycle is an international initiative aiming to help eliminate waste through collection and solution programs for all kinds of typically non-recyclable waste. The waste collection programs are nicknamed “brigades” and collect all sorts of waste from candy wrappers to pens. The collected waste is then turned into new products and materials, ranging form recycled park benches to upcycled backpacks. When students send in their waste to TerraCycle, they’re awarded points that can be redeemed for a variety of charitable gifts. Gifts range from providing a vulnerable family in a developing country with a month’s supply of feed for their livestock to helping young a girls’ school receive drinking water and clean sanitation facilities for a month. Series Introduction Seven classroom-ready lesson plans and five introductory videos highlight and explore the significance and importance of Canadaâ&#x20AC;&#x2122;s Capital Treasures. These treasures represent knowledge, sacrifice, commitment and ingenuity. This series of lesson plans is available for download at www.teachmag.com/curricula. These lesson plans were produced by the National Capital Commission (NCC) in collaboration with the Virtual Museum of Canada and TEACH Magazine. •	Use writing skills to create a brief historical narrative based on the building of the canal; •	Find out more about planning a commemorative monument; •	Understand that a variety of places, including waterways and landscapes, can reflect aspects of heritage, history and culture; •	Explore the storyboarding of informational videos. route linking central Canada with the Atlantic, via Montréal. Over the course of the next six years, Colonel By and his team of Royal Engineers mapped out a daring course through wilderness, swamp, and tough Canadian Shield rock. French Canadian and newly immigrated Irish workers supplied most of the back-breaking labour. Accidents and illness claimed the lives of many. Bytown Museum and Rideau Canal locks, 2006 Photo: National Capital Commission One of the first buildings John By built was the Commissary; today, it is the Bytown Museum and the oldest masonry structure in Ottawa. It is located to the left of the step locks in this photo, with the Ottawa River and the Canadian Museum of Civilization in the background. of the Ottawa River became Bytown. By 1855, the growing community was renamed Ottawa and, a few short years later, Queen Victoria selected Ottawa as the capital of the province of Canada. The queen had five cities to choose from: Toronto, Montréal, Kingston, Québec, and Ottawa. But Ottawa’s advantages were clear: the city was on the boundary between Upper and Lower Canada; it was a safe distance from the U.S. border; and it was easily accessible, mostly because of the Rideau Canal. Activity One: Write a Short Paper The British government was worried about disruptions to their supply lines if a war with America broke out. Using library and Internet resources, find out why the British were worried about this. Did they have a strong case? Argue your opinion in a short paper outlining the British position and exploring any alternatives to a massive construction project like the Rideau Canal. Activity Two: Take a Virtual Trip! Rideau Canal locks, 2007 Photo: National Capital Commission From the lowest level, the locks appear to climb the hillside like a staircase. The Fairmont Château Laurier (left) is a hotel; the Bytown Museum (right) is housed in a building that John By constructed. The winches that open and close each lock are in the foreground. Is the Rideau Canal used today? Draw a map of the canal from Kingston to Ottawa and include the types of activities that visitors can experience along the way. Imagine the region 50 years from now. What would the canal be like in the future? Many others helped Colonel By, including the labourers who built the canal and the Royal Engineers who came up with solutions to the various technical challenges. Propose a method to commemorate their achievements. In his lifetime, Colonel John By went from hero to villain. Remembering his ingenuity and dedication can be done in many ways, from monuments to special events. As a class, discuss the pros and cons of permanent monuments versus more transient events or commemorations. With a small group, propose an event, monument, or other commemoration to celebrate By’s achievements. such as Vancouver, Calgary, Winnipeg, Toronto, MontrĂŠal, or Halifax, or suggest another location (including a purpose-built capital) and, as a team, argue the benefits and potential of your city. How do you think a decision should be made? and outline why it received the designation. was renamed next year? If the place had to be renamed, what kind of a process would you want put in place to decide on the new name? Activity Seven: Bridging the River (Grade 8) Canals are created in order to facilitate the movement of boats and other water transport. However, engineers also had to consider how to provide opportunities for land transportation, such as railways, cars, horses and carts, as well as pedestrians, to cross the waterways. When the Rideau Canal was built, the engineers built several types of causeways or bridges, including elevated railway bridges and swing bridges. Look for photos of these online and research how these bridges worked and whether or not they have all been replaced with newer designs. With a partner, make an annotated diagram or model of a specific bridge that crosses the Rideau Canal and locate it on a map. Activity Eight: Writing about the Building of the Canal (Grade 9) Write a short story or script that is set during the building of the Rideau Canal (1826-1832). Include at least one dramatic scene. Research to find out more about the history of the Canal to jumpstart your ideas. For example, about 2000 people worked to build the Canal during each year of its construction. Most came from Ireland, fleeing poverty and famine. More than 500 workers died during the building of the Canal due to blasting accidents, drowning, or disease. (A monument to honour these workers now stands close to Parliament Hill.) Be sure the historical details in your narrative are accurate. Media Literacy Activity View the video “Rideau Canal Locks.” One way that videographers create films is to prepare a storyboard before filming. Of course, they may change their minds after they have completed the videoing and include or delete elements, but the storyboard provides them with a basic framework in which to work. View the video again, pausing it when you wish. What are the main scenes in the video? Jot down a brief description of each main scene with some details, for example, first there is a close-up summer scene of the locks, etc. Then, create a storyboard in simple panels to show the basic sequence of shots that make up the scenes of Rideau Canal Locks and approximately how many seconds each scene takes. Reflect on the decisions made by the creators. If they needed to reduce the video down to 40 seconds, what would you suggest they cut and why? 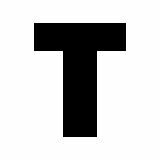 Block this out on your storyboard and see whether it would work. If Rideau Canal Locks could be increased by 60 more seconds, what would you suggest be included? Adapt your storyboard to show this additional content. Invite Mr. X Into Your Classroom! TEACH Magazine is pleased to present the fourth in the series of teen adventure stories for readers aged 11-14 years. Follow the antics of Xerxes Frankel and his crew in Mr. X and the Vancouver Iceman as they head to the Winter Olympics to film the hit television series, Get Outta Town! Fun, funny and entertaining, Mr. X helps you support literacy in your classroom. You can purchase Mr. X and the Vancouver Iceman, as well as the first three titles in the series, Mr. X and the Circle of Death, Mr. X and the Cog Train from Heaven and Mr. X and the Rainforest Monkey through Amazon.ca, Chapters/Indigo and other fine bookstores. Introduction Sept plans de leçon prêts à être utilisés en salle de classe et cinq vidéos d’introduction soulignent et expliquent brièvement la signification et l’importance des trésors de la capitale du Canada. Ces derniers représentent le savoir, le sacrifice, l’engagement et l’ingéniosité. Téléchargez cette série de plans de leçon en visitant la rubrique Curricula de TEACH Magazine – Le Prof à l’adresse www.teachmag.com/curricula. Produits par la Commission de la capitale nationale (CCN) en collaboration avec le Musée virtuel du Canada et TEACH Magazine. •	se serviront de leurs habiletés en cartographie pour tracer un parcours annoté; •	se serviront de leurs habiletés en rédaction pour écrire un court récit historique sur la construction du canal; •	en sauront davantage sur la planification d’un monument commémoratif; •	comprendront que des endroits variés, y compris les voies de navigation et les paysages, peuvent refléter des facettes du patrimoine, de l’histoire et de la culture; •	découvriront comment se font les scénariosmaquettes de vidéos informatives. Introduction Un cours d’eau peut-il être un symbole national? S’il s’agit du canal Rideau, la réponse est oui! Le colonel By et son équipe des Royal Engineers ont consacré les six années qui suivirent à tracer un audacieux parcours à travers le milieu sauvage, les marécages et le roc du Bouclier canadien. Les Canadiens français et les travailleurs irlandais qui venaient d’immigrer ont accompli la majeure partie du dur labeur. Des accidents et la maladie ont causé bien des décès. Photo de l’incendie de 1916 Photo : Bibliothèque et Archives Canada Après l’incendie de 1916, seule la Bibliothèque du Parlement est restée debout. Les observateurs disent avoir entendu la cloche sonner avant de s’effondrer sur le sol. Les travaux de construction des nouveaux édifices ont commencé presque aussitôt. blanchir son nom des accusations de mauvaise gestion financière. Grâce à la ténacité du colonel By et à l’arrivée des travailleurs du chantier du canal, la petite ville forestière des berges de la rivière des Outaouais est devenue Bytown. En 1855, la collectivité en pleine expansion a été rebaptisée Ottawa et, quelques années plus tard, la reine Victoria a choisi Ottawa pour capitale de la province du Canada. La reine avait le choix entre cinq villes: Toronto, Montréal, Kingston, Québec et Ottawa. Mais les avantages d’Ottawa étaient évidents : la ville était située à la frontière du Haut et du Bas Canada; elle se trouvait à bonne distance de la frontière américaine et elle était facile d’accès, principalement grâce au canal Rideau. 1re activité : Rédigez un court texte Le gouvernement de la Grande-Bretagne craignait que ses voies d’approvisionnement puissent être coupées si un conflit éclatait entre le Canada et les États-Unis. En vous servant des ressources de la bibliothèque et d’Internet, trouvez pourquoi les Britanniques craignaient cela. Avaient-ils de bonnes raisons de s’inquiéter? Appuyez votre opinion d’arguments dans un court texte expliquant le point de vue des Britanniques et explorez des solutions de rechange à un grand projet de construction comme celui du canal Rideau. Festivités de la fête du Canada, 2008 Photo : Commission de la capitale nationale Le parterre gazonné qui se trouve au pied de la tour de la Paix est le lieu de rassemblement du Canada, là où nous célébrons les évènements marquants et où nous nous souvenons de ceux et celles qui nous ont quittés. peuvent s’adonner le long du trajet. Imaginez la région dans 50 ans. De quoi aura l’air le canal dans l’avenir? Activité de remplacement : Nombreux sont les gens qui ont aidé le colonel By, y compris les travailleurs qui ont construit le canal et les Royal Engineers qui ont trouvé des solutions aux nombreux défis techniques. Suggérez une façon de commémorer leurs réalisations. 4e activité : La construction d’une capitale Plusieurs raisons déterminent le choix des capitales du monde. En classe, remuez vos méninges pour en trouver quelques-unes. Certaines villes sont créées précisément pour devenir des capitales; d’autres sont les plus anciennes du pays ou celles qui connaissent le plus de succès. Réfléchissez aux raisons qui ont amené la reine Victoria à choisir Ottawa pour capitale. Quelles autres villes ont été envisagées? Imaginez que le Canada ait besoin d’une nouvelle capitale. Divisez-vous en cinq ou six groupes. Choisissez une ville qui pourrait être candidate, par exemple, Vancouver, Calgary, Winnipeg, Toronto, Montréal ou Halifax, ou suggérez un autre endroit (y compris une capitale construite expressément à cette fin). En équipe, discutez des avantages et des possibilités qu’offre votre ville. De quelle façon devrait-on prendre cette décision? a) La construction du canal Rideau a d’abord et avant tout nécessité le savoir-faire de nombreux ingénieurs. Faites une recherche sur les aspects scientifiques de la construction du canal et présentez-les à votre classe. b)	Préserver notre histoire est important pour se souvenir de notre passé, mais aussi pour apprendre de notre passé. Faites une recherche sur les sites du patrimoine mondial de l’UNESCO. Quels types de sites ont été désignés? Y a-t-il des sites du patrimoine près de votre collectivité? Rédigez un court texte sur un site canadien du patrimoine de l’UNESCO et expliquez pourquoi il a été désigné. 6e activité : Renommez les collectivités (7e année ou 1re année du secondaire au Québec) Le village de Bytown a été fondé en 1826 et nommé d’après le colonel John By. Toutefois, en 1855, le village est devenu une ville et a été renommé Ottawa. Trouvez les raisons de ce changement. Que pensez-vous de cette décision? De nombreux endroits au Canada ont été renommés au cours des siècles. Certains portaient des noms autochtones à l’origine et ont été renommés par des colons français ou anglais. Récemment, des endroits ont été renommés pour des raisons politiques. Trouvez si l’endroit où vous habitez, ou n’importe quel autre endroit près de chez vous, a été renommé et, si oui, pourquoi. Comment réagiriez-vous si l’endroit où vous habitez changeait de nom l’an prochain? Si l’endroit devait être renommé, quel genre de processus devrait être mis en place, selon vous, pour choisir le nouveau nom? 7e activité : Des ponts pour traverser la rivière (8e année ou 2e année du secondaire au Québec) Les canaux sont bâtis pour faciliter le déplacement des bateaux et des autres moyens de transport par eaux. Cependant, les ingénieurs ont également pensé aux façons de se déplacer par terre, telles que le chemin de fer, la voiture, le cheval et la charrette et la marche, pour traverser les cours d’eau. Lorsque le canal Rideau a été bâti, les ingénieurs ont construit plusieurs types de ponts jetés ou ponts, y compris des ponts ferroviaires et des ponts tournants aériens. Dans Internet, cherchez des photos de tels ponts et faites une recherche sur la façon dont ils fonctionnent. Ont-ils été remplacés par des ponts plus modernes? Avec un ou une camarade de classe, faites un diagramme ou un modèle commenté d’un des ponts qui enjambent le canal Rideau et trouvez-le sur une carte. 8e activité : Rédigez un court texte sur la construction du canal (9e année ou 3e année du secondaire au Québec) Rédigez une courte histoire ou un script qui se déroule pendant la construction du canal Rideau (1826-1832). Le texte doit comprendre une scène dramatique. Faites une recherche pour en savoir davantage sur l’histoire du canal et vous donner des idées. Par exemple, environ 2 000 personnes ont travaillé à la construction du canal chaque année de sa construction. La plupart d’entre elles venaient d’Irlande, fuyant la pauvreté et la famine. Plus de 500 travailleurs y ont perdu la vie dû à des explosifs, à la noyade ou à la maladie. (Un monument a été érigé près de la colline du Parlement afin de leur rendre hommage.) Assurez vous de l’exactitude des détails historiques de votre texte. Activité de littératie critique Visionnez la vidéo « Les écluses du canal Rideau ». Une des façons dont les vidéographes créent des films consiste à faire un scénariomaquette avant de filmer. Bien entendu, ils peuvent changer d’idée après avoir terminé le tournage et inclure ou éliminer des éléments, mais les scénarios-maquettes leur donnent un cadre à suivre. Regardez la vidéo de nouveau en appuyant sur pause au besoin. Quelles sont les principales scènes de la vidéo? Notez une brève description de chacune des scènes avec quelques détails, par exemple, le gros plan des écluses en été, etc. Ensuite, créez un scénariomaquette en groupe pour montrer le planséquence des scènes des « Écluses du canal Rideau » et notez la durée approximative de chacune des scènes. Réfléchissez sur les décisions des créateurs. Si l’on écourtait la vidéo à 40 secondes, que supprimeriez-vous et pourquoi? Éliminez cet extrait de votre scénario maquette. Est-ce que ça fonctionne? Si l’on allongeait « Les écluses du canal Rideau » de 60 secondes, que devrait-on ajouter, selon vous? Adaptez votre scénario maquette pour montrer ce contenu supplémentaire.